Mostly for Splunk administrators and consultants, this cheat sheet contains hints for props.conf, the most common date and time format variables, some hints on rewriting default fields, using lookups, and more. Get it here. Need some hints and quick tips for setting up rsyslogd or syslog-ng? Our syslog cheat sheet has you covered. Building a Splunk app for yourself? Maybe something you want to share on Splunkbase? 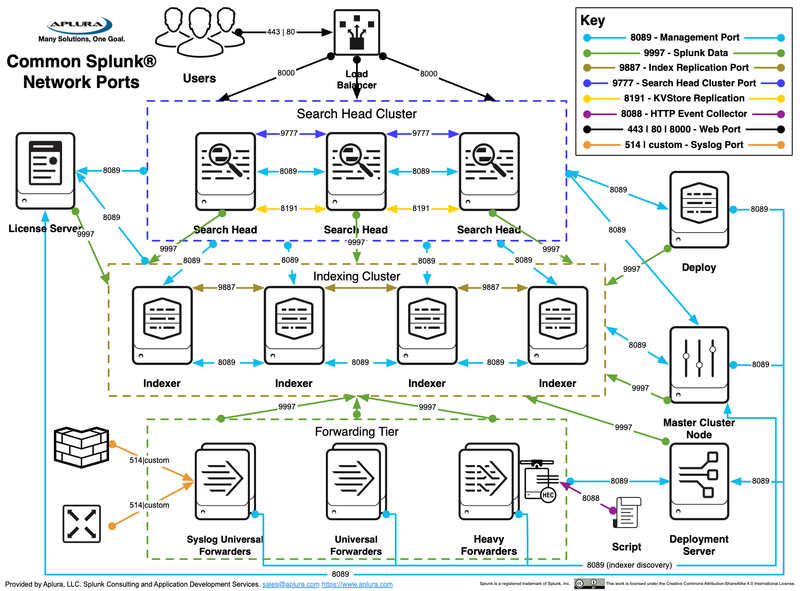 Check out the Splunk AppDev cheat sheet for tips and tricks on making your app successful. Want to make sure you are following the best practices for securing your Splunk deployment? Our Securing Splunk cheat sheet can help guide you along. Setting up Search Head Clustering and need a quick-start? Our Search Head Clustering cheat sheet can help you get up to speed. Common network ports when looking for firewall rules. Always remember to check your configs, as Splunk lets you change most of these. Also available as a PNG. We get a lot of questions about where a props.conf configuration belongs, so we created this flow chart to help identify the proper location.